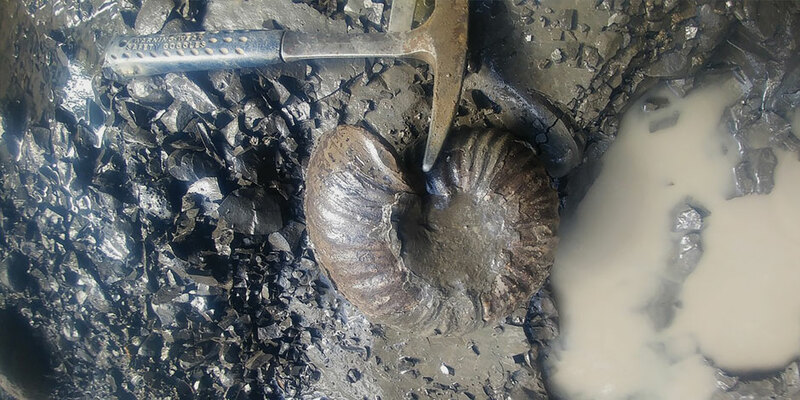 The Trent River’s unique ecology has made its banks host to many exciting fossil discoveries, by palaeontologists and casual visitors alike. Have you ever wondered about parked cars at the side of Highway 19, near the bridge about three kilometres south of Courtenay? It’s a clear sign that people are exploring the amazing Trent River. The first thing you’ll notice after a short hike is that the river banks are made of layered grey sedimentary rock called shale. During the time of dinosaurs, Vancouver Island was under the ocean. This shale is compressed mud from the bottom of that ancient ocean. Many significant fossil discoveries have been made in the banks of the Trent River over the years: mostly hard things like bones, teeth, shells, wood, leaves, and seeds. Many of the major fossil discoveries have been found within 300 metres of the Highway 19 bridge. Just downstream from the bridge in a high walled bank, two turtle fossils were found. One is thought to be a large marine turtle similar to the Pacific Green turtles of today, and the other turned out to be a very rare specimen of a soft shelled, freshwater turtle. What’s a freshwater turtle doing out in the ocean? It may have washed down a river and floated out to sea the same way wood, leaves, and seeds are deposited in the ocean. Close by, a bizarre-looking ancient predatory fish was found. It looked like a barracuda with a sword-like nose and stiff pectoral fins serrated at the edge. Another bizarre fish was discovered just upstream of the bridge that turned out to be the fossil of a ratfish. Ratfish are still alive today, but are much smaller than their ancient cousins. This new species was the first ratfish fossil found in western North America, and discovered by a first-time fossil collector. Every twist and turn in the Trent River has its own natural beauty, with the wonderful flora and fauna of today, but also the weird and wonderful from our ancient past. While walking the Trent River you are actually exploring two places at the same time—the Trent River of today and the ancient seafloor of 80,000,000 years ago.